To help you gain an edge over the massive competition in NEET PG, PrepLadder is launching its smartest pack yet. The NEET Vital Pack is carefully constructed to help you increase your NEET PG scores. Questions for NEET Vital Pack have been prepared after scrutinizing recent NBE exam pattern and they WILL appear in all NEET PG slots. NEET Vital pack will consist of MCQs under 5 categories. Never miss a test with PrepLadder. You can take any live test according to your convenience and study schedule. Each test will be valid till June 2018. 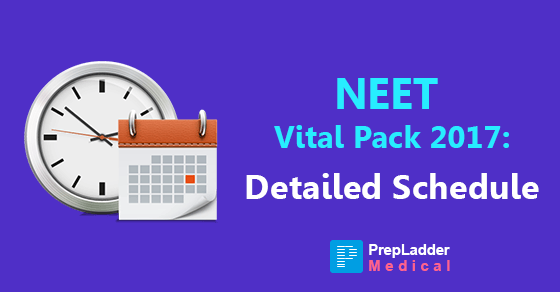 The detailed schedule for NEET Vital Pack 2017 is mentioned below. However, the date mentioned only indicates when the test will be made live. You can take tests whenever you want to and you will still get a live rank among thousands of PrepLadder competitors. 1. 30,000+ competitors to give you a genuine competition analysis. 2. All doubts answered by experts within 24 working hours. 3. Personal mentorship from recent toppers. 4. Artificial intelligence software that tells you your weak topics. 5. All PrepLadder exams are now conducted on the new TCS software. When can you register for NEET Vital pack? NEET Vital pack is now live. Register now to avail Flat 20% off + 20% CashBack. To avail the offer, click here. PrepLadder is with you in your every step towards clearing NEET PG so gear up and prepare well. All the best for NEET PG. Keep Following PrepLadder! !